We’d love your help. 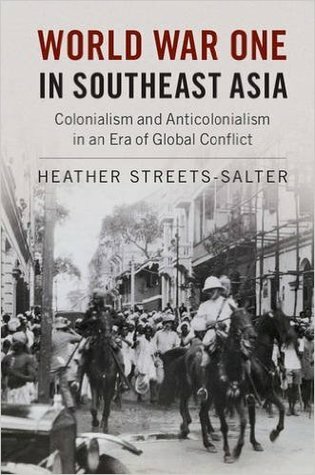 Let us know what’s wrong with this preview of World War One in Southeast Asia by Heather E. Streets-Salter. To ask other readers questions about World War One in Southeast Asia, please sign up. Heather Streets-Salter is the Chair and an Associate Professor of History at Northwestern University, Boston, Massachusetts, USA. She received her PhD in 1998 from Duke University, USA. Streets-Salter’s research focuses on world history, the structure of empires and colonial relationships, and the scholarship of pedagogy. She is the author of Martial Races: The Military, Martial Races, and Masculin Heather Streets-Salter is the Chair and an Associate Professor of History at Northwestern University, Boston, Massachusetts, USA. She received her PhD in 1998 from Duke University, USA. Streets-Salter’s research focuses on world history, the structure of empires and colonial relationships, and the scholarship of pedagogy. She is the author of Martial Races: The Military, Martial Races, and Masculinity in British Imperial Culture, 1857-1914 (2004), Traditions and Encounters: A Brief Global History (2006, 2009, 2012) with Jerry Bentley and Herb Ziegler, and Modern Imperialism and Colonialism: A Global Perspective (2010 and 2014) with Trevor Getz. She is completing a monograph entitled Beyond Empire: Southeast Asia and the World During the Great War, which explores the multiple impacts of World War I on this region. This monograph is integrally related to her current research interests in studying imperialism and colonialism as global phenomena. She argues that colonial histories cannot be understood without reference to neighboring colonies, rival metropoles, and even—in this case—extra-colonial locations such as China, the United States, the Ottoman Empire, and Germany.